Chelsea boss Maurizio Sarri has questioned whether or not his side are creating enough chances to go with their possession after a frustrating draw with Everton on Sunday. Wins for Man City and Liverpool saw the two sides open up some room between themselves and Chelsea, with the former now four points ahead of Sarri’s men. It came after their inability to find a way through against Everton, as they were held to a goalless draw at Stamford Bridge without seemingly creating enough goalscoring opportunities to go with their possession. Chelsea enjoyed 69 percent of possession during the encounter, although they managed just four shots on target in that time. 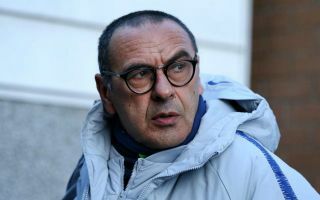 In turn, Sarri has conceded that it is a ‘little problem’, as the Blues must turn that dominance into goals having also struggled in midweek away at BATE Borisov in the Europa League. “In the last three matches we created few goal opportunities in relation to how much we played. So, in this moment, it’s maybe a little problem,” he said, as quoted by ESPN. “But three matches is a very short time, so I don’t know. Maybe it’s chance. But we have to be careful, I think. In fairness, Chelsea had scored 18 goals in the six games before that BATE clash, while they’ve scored more than the likes of Liverpool, Tottenham and Arsenal in the Premier League so far this season. With that in mind, it shouldn’t be a case of panicking, but more so about working to rediscover that form in front of goal prior to this week to ensure that they remain on course to achieve their targets this year.